The Chocolate Goddess brings you a chocolate cake fit for the best Dad in the entire world, your Dad. Your Father’s needs are simple – he’s a humble guy who is happy with a ball game, a small gift and a chocolate cake. In fact, he will even barbecue for you on his special day. Make sure you’re not serving him average, supermarket bakery cake. This Big Daddy Chocolate Cake is your gift to him - a gift of your time and effort to show him you appreciate all he does. This colossus of a dessert is perfect for Dad. After all, he is a giant among men in his children’s eyes. Monumentally tall, there are three layers of chocolate fudge cake that are moist and tender and have a silky-smooth feel. Chocolate buttercream is stacked generously between the layers. This cake demands that you just go for it, and mound the buttercream - more is more in this paradigm - and those pillows of chocolate will wow Dad. That isn't all though, the frosting is a fudge icing made with lots of melted chocolate. 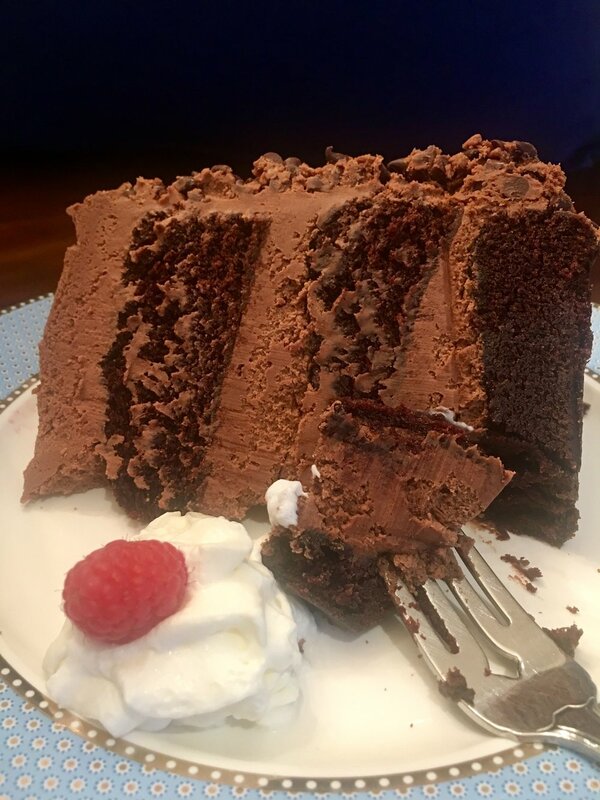 No counting calories today, but you can count on making a Big Daddy Chocolate Cake, par none. This is a truly delicious and decadent reward, an indulgence fit for your hero. Butter the interior of 3 cake pans with real butter. Dust with flour and shake out excess. Combine milk and vinegar and set aside. In a large bowl combine flour, sugar, sifted cocoa powder, baking soda, baking powder and salt. Add buttermilk, vanilla and oil to eggs and whisk together. Combine egg mixture with flour mixture on very low speed, so dry mixture doesn’t fly out of the bowl. Boil water and add to bowl. Mix on medium high speed for about 2 - 3 minutes, wiping down sides and bottom of bowl occasionally until all is combined. Bake for 30 – 35 minutes, checking often at the end until toothpick inserted in center comes out clean. Turn onto racks and let cool completely before frosting. Let butter stand at room temperature no more than 30 minutes, less if it is warm in your house. You do not want your butter too warm because it has to hold up in between the cake layers. Add powdered sugar and beat until incorporated. If you feel the buttercream is not pliable, add heavy cream a tablespoon at a time. Keep the buttercream on the thick side. Spread the buttercream abundantly between the first and second layers. Do not frost the sides and top of cake, they will be frosted with the chocolate fudge frosting. Refrigerate cake while preparing the chocolate fudge frosting. Break up chocolate into small pieces. Leave 2 tablespoons of chocolate aside. In a large glass bowl, melt the rest of the chocolate and butter on very low power level in microwave (I use power level 3). Patience is important because if chocolate burns, it’s a do-over. Stir vigorously every 30 seconds, to incorporate butter and help in melting process. When the chocolate is just about melted, remove from microwave and add remaining tablespoon of chocolate. Stir until all is melted. Refrigerate and stir every 10 minutes so chocolate doesn’t set until mixture is cool. Beat in Vanilla and Confectioners® Sugar. Add milk to thin, slowly a tablespoon at a time, and only if necessary. Hand press on chocolate mini morsels. Be patient, this takes time, but is well worth the effort! If it is warm, keep cake refrigerated until 30 minutes before serving.